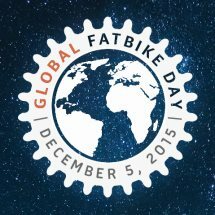 On December 5th, 2015, people from all over the globe, will get out for a ride on their fat-bikes! They’ll go for a solo cruise or maybe make plans to gather their fat-bike amigos, for a group ride! Stay tuned for what time and where we will be Fat Biking for Global Fatbike Day. Don’t forget your camera, because part of the Global Fat-Bike Day celebration will include sharing your experience, through photos and video!